FileSwap isn’t a backup service but online file sharing platform like MediaFire and 4shared. However, the features are barebone, support is almost non-existent and price is high at $9.95 per month for just 50GB of storage. The only saving grace is in its straightforward and easy to use interface. Read the full review below or sign up now. FileSwap is not your usual backup solution. In fact, more accurate description would be sharing and upload facility on the cloud”. It primarily targets home users who desire no-fuss online backup features. Although it has good share and upload capabilities, Fileswap, however, doesn’t provide file management and backup facilities and as such files aren’t securely kept. But, if users want to share and download files then they can try Fileswap. Be wary, however, because the company doesn’t offer customer support, value-for-money, and backup features. There are four plans currently offered, and two of them are free. The Anonymous” plan is free and is usually for users who need to share a file quickly. It doesn’t have any other features offered by FileSwap, just purely uploading a file and sharing to others. The Personal FREE” doesn’t cost anything and provides easy access to files from anywhere and anytime. It also has a sync function which can run on different platforms. Files uploaded online can be tracked and shared. Users who take advantage of Personal FREE” can expect to upload a total of 15,000MB files while the maximum file size that can be uploaded in a single instance is 250MB. Fileswap can accommodate at most 5,000 files and 50kbps maximum download speed. It offers desktop and mobile syncing, sharing of entire folders, and file manager and stats features. The Personal+” plan, on the other hand, is available for $9.95 per month with file storage limit of 50,000MB and 2,000MB maximum file size limit. Unlike the Personal FREE”, the Personal+” plan has no limit on the number of files uploaded. It provides a maximum download speed of 1,000kbps. Aside from the file manager and stats, sharing of entire folders, and mobile and desktop syncing, users can instantaneously download files and get download speed priority. The Personal+” plan is also advertisement-free. For users who want to purchase additional space, FileSwap charges $5 per 50GB. Lastly, the Professional” plan serves as a private cloud for the users. Users’ files are hosted in FileSwap’s Tier4 data centers in a secure, non-shared environment. The price for this plan is available upon request. Unlike the other plans, the Professional” plan doesn’t have any restrictions as to file size, file storage, and number of files, and can have unlimited number of users. Like the Personal+” plan, it has 1,000 kbps maximum download speed, file manager and stats, entire folders sharing, desktop and mobile sync, no download wait time, advertisement-free, and download speed priority. The $9.95 per month price is quite expensive because there are similar packages available from other providers who offer better features at almost half the FileSwap’s cost. We will bring you a table with comparison of each plan’s features and prices shortly. 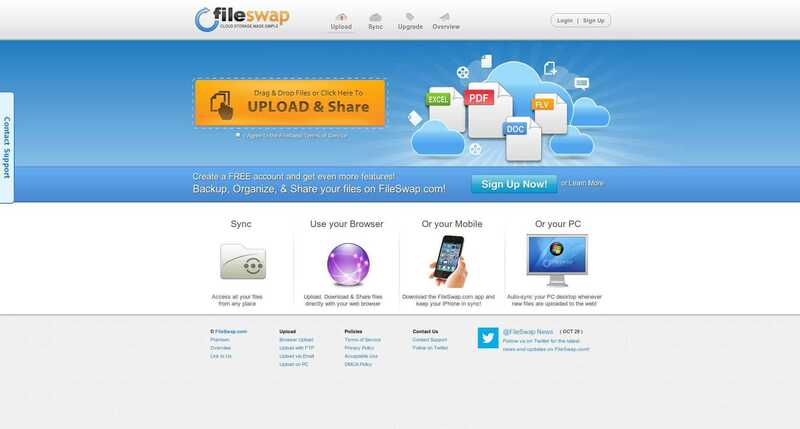 FileSwap is not an online backup facility but an online file-sharing platform. For light users, the Personal FREE” plan is a great choice. But it doesn’t really sport much features. Share large files. For those who need to share large files, they can take advantage of Personal+” plan, which lets you upload up to 2GB for each file. Mobile and Desktop sync. 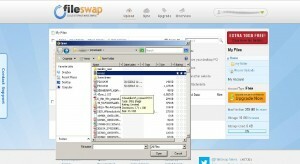 FileSwap is easy to use with great file syncing feature. However, it is difficult to manage uploaded and synched files. Folder sharing. It allows sharing of entire folder thus users save time and effort. Files stored in FileSwap aren’t deleted and stay online as long as the user has an account with the company. Easy to use dashboard. The control panel is also easy to use and there isn’t much features being offered. Thus, even those users who aren’t adept with application technologies can use FileSwap without any glitch. FTP. If you don’t want to use FileSwap syncing software or use browser to upload files, you can also use FTP to connect and upload your files. Email upload. If you are on the road and don’t have access to FTP client, or don’t want to log-in into FileSwap account, then you send an email to FileSwap. Each user will get unique email address where they can send their files to. File sharing. Sharing of files can be done through Twitter, digg, and Facebook plug-ins, email, and direct links. Because FileSwap is a public file sharing facility, the only security it can offer is to put passwords on users’ folders and files although the company’s website announced that it will come up with key-based encryption on files soon. There is no information on the encryption method or their infrastructure. The only way users can contact FileSwap for support is to fill up its feedback form found on its website. The company, though, has a Twitter account which can also be used as a venue to contact customer support. My experience with FileSwap’s customer support is subpar. The response is really slow and almost non-existent. I found out that many other FileSwap customers also share the same sentiment. If you are just looking to upload a single file, then you can do so from the home page without having to register. 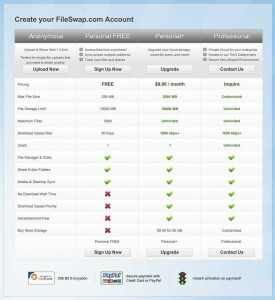 However, to utilize FileSwap’s full features, signing up at least a free account is necessary. When you go to sign up page, it brings you immediately to pricing plan page, where features are compared in a table. Personal Free plan will let you sign up or even log in using Facebook account. If you choose Personal+, it will bring you to payment page. You can pay by either PayPal or credit card, which is quite convenient as sometimes I actually want to only use PayPal. After you finished the sign up step, then an activation code will be sent through email. Once activated, it will lead you to the FileSwap main screen. The dashboard is very straightforward and you can immediately upload files here. You can now use the file-sharing feature of FileSwap. To create a folder, you can just click on the New Folder” tab found on the upper portion of the screen. A smaller screen will appear to prompt you for a folder name. As an example, I have created a folder named My Folder here, and it immediately shows up here after I created. Honestly, the interface isn’t as slick as others but it’s simple to use. Uploading files is also a straightforward affair. To upload a file, you can click on the Upload and Share” button for a new screen to appear. Then all you have to do is browse and choose files to upload online. I tried uploading several files as well as just one file. I actually find that other services like MediaFire and 4shared are faster than FileSwap. Moving files to a different folder isn’t very intuitive. Here, you will have to check the box next to a file and then click the Tools” tab and choose Move Selected”. A screen will appear asking where the files will be moved. I would prefer them to use HTML5 drag and drop function, which is done by so many other sides. It is a lot more intuitive when it comes to file management. Sharing files and folders is the same. You just have to select the files and folders you want to share by ticking the check boxes next to the files/folders, then go to “Tools” tab and just choose “Share Selected”. The URL and shortened URL will then be provided so that we can give out the links to other people. If you want to make sure that no other eyes apart from the intended ones have access to your shared files and folders, you can put password on your shared files and folders. To put password on a file or folder, users can click the box adjacent to the file or folder and then click on Tools” tab found at the end of the chosen file or folder. They can now set the password. Honestly, this is only useful if whoever you share the file to won’t give out the password to others. Other processes like renaming and deleting are also via “Tools” tab. Just explore it as the interface is really straightforward. 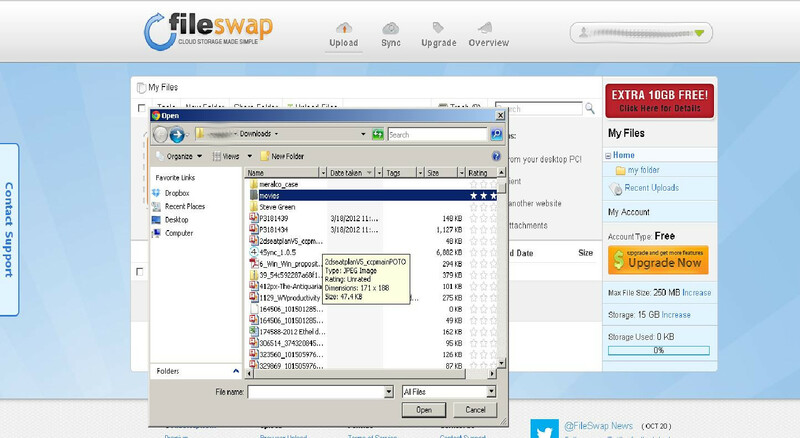 FileSwap also has the capability to sync files and folders from the computer or mobile phone. The software is available on FileSwap website, and for mobiles, there is an app on iOS. No Android, Windows Mobile or BlackBerry apps exist yet. Aside from uploading the files and folders through the browser, the FTP can also be used for uploading. However, an FTP client must be downloaded first. I will wholeheartedly recommend FileZilla for its simplicity and general awesomeness. To connect to FileSwap via FTP, you just have to connect to “ftp.fileswap.com” from your FTP client, and use your username and password to login. However, there is one catch about using FTP. Although it is faster than using browser to upload, the uploaded files may take about 1 hour to show up in your FileSwap account. For what reason, I cannot fathom. But if you are in hurry and want to see your files in your account immediately, I would suggest you to stick to FileSwap syncing software or the browser uploads instead. If you are on the road or on another computer and have a file to upload to your account, you can also use your email. The files must be attached to the email and sent to your_own_unique_code@upload.fileswap.com. You can find your own unique code in your dashboard. The files will appear in the gmail-attachments” folder. One good thing about this is that your files will immediately show up in your FileSwap file list. However, a catch here is that maximum file size you can upload is limited by your email provider. Some email providers do not allow a single file to be larger than 20MB so this is a bummer. But for a quick and easy upload, this is one of the easiest ways. Personally, I feel that FileSwap falls short on many fronts. Granted, it is not a backup service so comparing it to other backup companies won’t be fair. But even when compared to services like 4shared and MediaFire, it really doesn’t offer as much features as others. Customer support is almost non-existent, and I have heard of horror stories from some customers about difficulties in retrieving their files. Will I recommend it to anyone? Maybe, if you are looking to upload a few files and share them. But if you are looking for a home for your files to exist online, FileSwap isn’t something you want to go for. Plus, at $9.95 a month, you can get much better services and storage from other companies like DropBox, MediaFire and heck, even just a normal FTP hosting service will give you more bang for your buck. I signed up to them as I wanted to download a locked file, been using them since to share files, excellent.